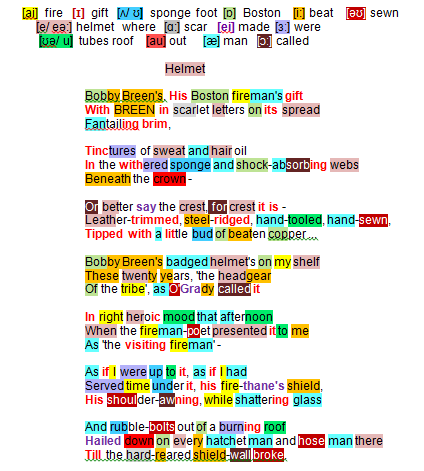 The poem focuses on an Boston fire-fighter’s headgear, symbolic of a breed regarded as god-like ‘supermen’ risking their lives for society especially after 9/11. It was presented ‘formally’ to Heaney in an informal ceremony in Boston. The poem celebrates heroism and human solidarity. A helmet – its owner; its provenance – a Boston fireman’s gift, bearing the name printed boldly on its spread / Fantailing brim , an elongated shoulder-awning. The eye is drawn upwards: evidence of its energetic use (tinctures of sweat and hair oil) and its enduring longevity (withered sponge and shock-absorbing webs); its dome not a civilian crown , but rather a proud classical symbol of ‘military’ prowess crest, for crest it is; its particular strength (steel-ridged) and individuality (hand-tooled, hand-sewn) held together at the top with a reminder of military armour of the past: a little bud of beaten copper. An exclusive badged helmet ceremoniously presented to Heaney twenty years before as visiting fireman by a fellow fireman ‘poet’ (Heaney modestly returns the compliment) and proudly exhibited in his home – a symbol, too, of a solid, self-sacrificing mind-set: ‘the headgear/ Of the tribe’ handed over jovially one afternoon in right heroic mood. America is justly proud of her ‘heroes’ and the poet chooses his adjective deliberately as he enters into the spirit of the event. Flattered by any association Heaney, is stutteringly modest, as if …as if. He has not served time under this helmet and symbol of classical nobility, this fire-thane’s shield. He pictures the active circumstances of fire and its falling debris – as the twin towers collapsed around them the helmets and their wearers fought on to the very end: Till the hard-reared shield wall broke.